Callahan County, located in west central Texas, is surrounded by Taylor County to the west, Jones County to the northwest, Shackleford County to the north, Eastland County to the east, Brown County to the southeast and Coleman County to the south. 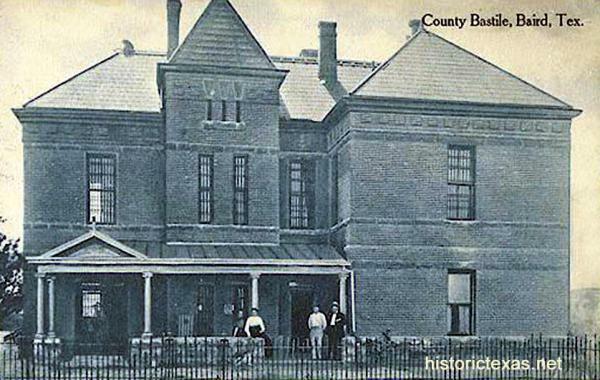 Baird, the county seat, is 20 miles east of Abilene. Callahan County. Formed from Bexar Territory, created February 1, 1858; recreated August 21, 1876; organized July 3, 1877. Named in Honor of James H. Callahan, 1812-1856 soldier in the Texas Revolution, captain of the Texas Rangers. County Seat, Callahan City, 1877; Belle Plain, 1877-1883; Baird, since two early military roads, the Chisholm Trail, and the first government telegraph line traversed this region. – Historical marker text. Marker erected 1936. Callahan County 1922. The Legislature of 1858 gave the boundaries to Callahan County. but its population did not justify a county organization until 1877. The first county seat was Belle Plain, but when the Texas & Pacific Railway was constructed through the county in 1881 its line was six miles from the county seat and the Government was subsequently transferred to Baird. The other railway stations established soon after the railroad came were Clyde, Vigo and Putnam.